Lenovo has started a new milestone in the computing industry by introducing a ThinkPad laptop that features two LCD screens. This new ThinkPad W700ds appears to be the first laptop ever that has two LCD screens, a 17-in primary screen and a smaller 10.6-in secondary display panel. The secondary display can be tilted up to 30 degrees like a car’s rearview mirror. Measuring 16-in x 12-in x 2.1in, this dual screens ThinkPad W700ds laptop weighs about 11 pounds, about double the weight of other typical laptops. Of course it looks a bit bulky and heavy to carry along while traveling, but it will be very useful for people who need multiple screens while doing works e.g. stock market analysts, accountants, reporters and so on. Stock market analysts, for instance, can utilize the dual screens facility to do chart analysis while writing a report. 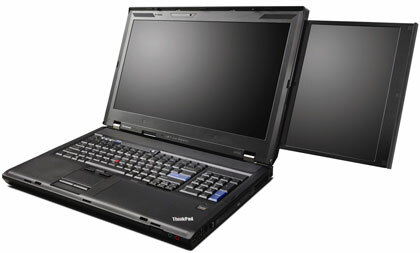 The original ThinkPad W700 used Intel Core 2 Extreme X9300 chip when it was launched earlier of the year. To reduce the cost and make it more affordable, Lenovo offers users an alternative option to use the less expensive quad-core Intel Core 2 processors in ThinkPad W700ds. This ThinkPad W700ds comes with 8GB of DDR3 memory and a pair of hard drive/solid-state drive bays for up to 960GB of storage. It also runs under dual fans and dual heat reduction systems to make the device stay cool to optimize the performance. This dual screen laptop will go on sale in January and the price starts from $3600.